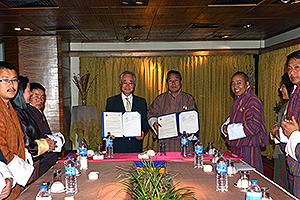 Since fiscal year of 2011, the Tokyo National Research Institute for Cultural Properties (TNRICP) has been cooperating with the Department of Culture (DOC) of the Ministry of Home and Cultural Affairs of Bhutan on the study of traditional rammed earth buildings. This cooperation was triggered by the successive earthquakes in 2009 and 2011 that caused severe damage to buildings constructed with the traditional method. The urgent task of striking a balance between ensuring safety by improving the seismic capacity of both public and private buildings and protecting/inheriting the traditional method that is still widely used in housing construction, etc. has become the center of attention. The research programme centered on the buildings constructed with earth rammed inside the wooden formwork from the perspective of both understanding and analyzing structural performance and clarifying traditional architectural techniques. Meanwhile, a legal framework for the preservation of private residential buildings as cultural heritage was being developed. 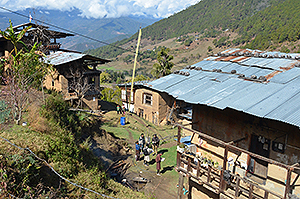 Therefore, since fiscal year of 2016, investigation efforts have focused establishing basic typological and chronological indexing of rammed earthen traditional houses under the Grant-in-Aid for Scientific Research (“Research on the typology and chronology of rammed-earth buildings in Bhutan,” Principal Researcher: Nobuo KAMEI, Director General of TNRICP). In the joint field survey conducted from March 4th to 16th, 2017, a measurement survey, among others, was conducted on a total of 16 traditional houses in Thimphu and Punakha prefectures, where efforts were made to collect information for studies of the original building shape, construction period, history of modification, etc., including observation of remaining traces and interviews with residents. Further, during this time, a research cooperation agreement was signed by the representatives of both parties, the aim of which was to further strengthen cooperative relations between the Institute and DOC. While considering the feelings of the people of Bhutan, who are keen to continue protecting their tangible and intangible traditional culture, we will continue working on this investigative research in hopes of contributing to the clarification of cultural values of historic architectures.